Even as you read this, someone somewhere in India has been injured or has died in a road accident. 2017 saw an average of 1,274 accidents and 405 accident deaths taking place on Indian roads each day – or 53 accidents and 16 deaths every hour. These absolutely shocking numbers have goaded the government, industry and other stakeholders to actively debate the path ahead to ensure safer roads. This involves a multi-pronged approach to solve the problem that identifies actionable steps under different heads – to make vehicles safer, rework road design and spread awareness among road users to follow traffic discipline. FY2018 saw 3.28 million passenger vehicles (PVs) being sold in India, of which 2,173,950 were cars, 921,780 SUVs, and 192,235 vans. In 2016, 23 percent of the total vehicle accidents involved PVs. With the PV market currently growing at around 20 percent and airbags set to become standard fitment from October 2019, airbag suppliers have a humongous opportunity – estimated at Rs 2,000 crore to Rs 2,400 crore spread over a few years – staring them in the face. It is an opportunity like this which has Tier 1 suppliers bullish on future growth in India. One such company is Lectra India, a wholly owned subsidiary of France-based Lectra, an integrated technology solutions provider that automates, streamlines and accelerates product design, development, and manufacturing processes for industries using soft materials. The three-decade-old Lectra India caters to industry such as automotive, fashion and furniture. Automotive with 50 percent is the biggest contributor to overall revenues with Lectra solutions in the form of passenger car interior, seating solutions and airbags. Lectra has integrated cutting room solutions for the cutting optimisation of fabric and leather vehicle seat covers and interiors and airbags. The company claims it has almost 100 percent market share in these solutions with Indian automakers and their Tier 1 suppliers. “Our forte has been the car interior trims, seat solutions including fabrics and leather and airbags. Initially, we were focused on the fabric solutions for seats and interior trims. Now the big emerging opportunity in India is the growing airbag solutions,” says Nagesh BT, director, Lectra India. Nagesh BT: "The big emerging opportunity in India is the growing airbag solutions business." With both the government sharpening its focus on vehicle safety, which will see airbag fitment becoming mandatory on all passenger vehicles and consumers also becoming more aware and willing to spend more on safer vehicles, there will be huge demand coming for airbag manufacturers and their suppliers like Lectra. While the company already caters to this segment in developed markets in a big way, it is beginning to see demand coming through in India. Around six years ago, interior and seating solutions were the bigger revenue contributors for Lectra. However, in the past couple of years, its airbag business has seen significant growth. “A few years ago, safety was not seen as a priority; today this has changed. Our customers are not looking at airbags for only premium cars but also for entry-level cars which will have a minimum of two airbags. This will become a necessity and then become mandatory,” says Nagesh. Lectra believes airbag demand in India will constitute its next phase of growth in the coming two to three years. Being a life-saving product, airbags and top-notch quality go hand in hand. Superior control of quality is required to meet the increasingly stringent requirements of the uncompromising airbag manufacturing process. Lectra says that with its pre-production software and the latest laser cutting technology, airbag manufacturers can reduce their cost per unit while producing defect-free airbags first time around, maintaining their profitability and competitiveness while contributing to the road safety value chain. Lectra’s FocusQuantum (software suite and laser cutting solution) is a comprehensive airbag solution, combining technologically advanced laser cutters for either one-piece woven (OPW) airbags or cut-and-sew airbags, as well as a purpose-built software suite and full range of value-added professional services covering implementation, change management and support. The company claims all its products are Industry 4.0 compatible. For its vehicle interior technologies, it engages with the customer right from the concept stage through to design and development and the final stage of cutting the seat accurately. The company promises close to 2 percent savings across the entire process. In India, Lectra works with Tier 1 suppliers for interior parts including seats on almost every new car program under development. The company says its expertise also comes into play when OEMs seek a design change for the seats, be it multi-colour or the fabric mix, for a new passenger vehicle variant. 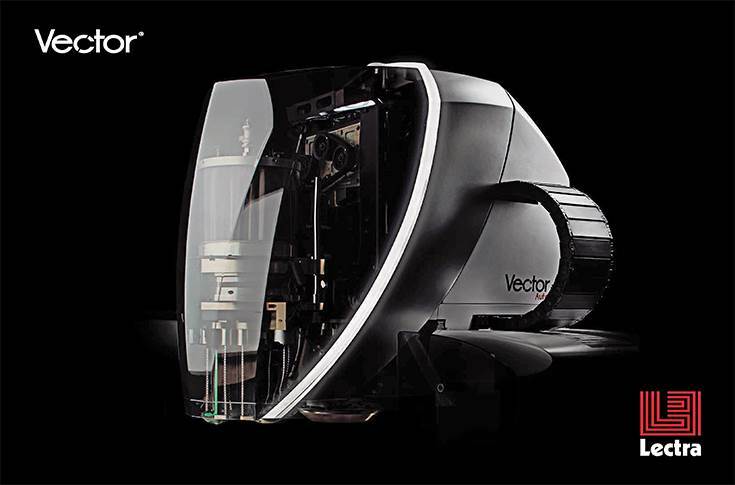 Lectra's Vector cutting solution ensures outstanding cutting quality while maximising production output, using specialised embedded tech and anti-error systems. According to Nagesh, today’s car buyer is open to making many choices and when it comes to seats, they could be dual or multi-colour, different fabrics and coupled with leather. It’s the same with OEMs which are increasingly offering colour and fabric selection for the seats in their cars. For example, Maruti Suzuki’s premium Nexa showrooms allow customers to select seat colour and fabric of their choice. This increasing trend of customisation and variations in demand is challenging for Lectra’s engineering team but the company says it has already anticipated this change in demand patterns and is working towards addressing the trend. In one of its global success stories, Lectra Tier I customer Tachi-S Mexico, a seating solutions customer, was looking to improve production capacity, reduce operational costs and quality defects in order to take advantage of expected growth. Lectra worked closely with Tachi-S teams to determine the underlying causes of the high running costs and low performance, and understand the company’s main challenges. After the completion of two phases of this consulting project, Tachi-S Mexico’s equipment efficiency rose from 56 percent to 72 percent, production volumes increased from 550 to 1,000 car seat sets per day, and the company obtained a 50 percent, 120 percent, and 137 percent improvement on three different materials. Lectra has a complete 3D/2D CAD solution specifically for automotive manufacturers and suppliers. The DesignConcept Auto software suite has been designed for developing automotive seats and interiors and covers all processes from design to manufacturing. It helps analyse design alternatives, control cost targets and technical feasibility, reduces the number of physical prototypes, develops models more quickly, and reduces the environmental impact of products. Lectra says its Versalis machines are a comprehensive and integrated solution dedicated to the leather cutting process. The machines manage the entire process from production management, identify flaws, automatic nesting, to the cutting and offloading of pieces. They ensure optimised use of available hide surface, high cutting quality and the best productivity. Similarly, with the Brio X250 Auto spreading solution, Lectra has created a cutting room suitable for car seat manufacturers, their processes and their constraints. “We see the Indian automotive sector as one of the most exciting markets globally, but at the same time highly demanding in technologies. Our new- generation machines have new advanced technologies such as Artificial Intelligence and IoT solutions embedded to help our customers with a specific solution,” concludes Nagesh.